Growing up on a dairy farm during and immediately after World War 2, I was lucky to have a father who valued education, and took every opportunity to use practical farm operations to illustrate principles of science, mathematics, biology and language. Christmas presents in the Curnow household were invariably linked to education. When my friends received a “Daisy Air-rifle” I would perhaps receive a Meccano Set – or most likely the Australian equivalent an “Ezy-built”. When they might get a large metal toy – I would get a book such as “How and Why It Works”, an Encyclopaedia or Arthur Mee’s “Book of a Thousand Beautiful Things”. Our farmhouse prided itself as having more books than the one teacher school my sister and I attended. At age four I told my mother that I intended to build bridges and buildings like the ones we saw in Brisbane on one of our rare visit there by train. As my awareness of technologies that were evolving quickly after the war, matured; my goal sharpened down to the pursuit of either aeronautical engineering or architecture. Quite an ambition and a challenge for a “Boy from the Bush”. The farm was sold in 1952 and the family moved to Brisbane so that my sister and I could attend a high school. Any notion of doing aeronautical engineering evaporated when I found out that the only course available at that time was at Melbourne University. However a Commonwealth Scholarship secured a place in architecture for me in then Queensland’s only university – The University of Queensland. At that time, the architecture students took mathematics, chemistry, physics , surveying and geology with the engineering students. I consider the engineering content of the UQ course in the 1950-60’s shaped my career – although it also caused a hiatus half way through the six year course when I thought that I would be a failure of an architect. I seemed to be forever out of step with the remainder of my cohort. I was more interested in the architecture of crystals, the structure of honeycomb, the interactions between soap bubbles, the development of reinforced plastics, the structure of the universe, the internal workings of cells and the structure and nature of subatomic particles. I gave up the course for about three years and built sports racing cars – until I met the lady who convinced me to at least finish my degree before taking off on a tangent. She asked me to look at some of my friends who were about to graduate and ask myself the question – are you any less capable of being a successful architect than they are”? (Answer no!!! – and yes, I married that person, one Margaret Neumann, a teacher who had been born on the Lutheran Mission in New Guinea). After eating considerable quantities of humble pie I was admitted back into Architecture. The faculty staff had changed and although I still tended to be the odd man out, this was now encouraged. I was interacting with students from other faculties on an unofficial way to see an engineering or a physics or chemistry point of view to architectural projects. I trawled through back copies of “The Lancet” and various science journals in the main library. I was coming to the view that the most important things occurred at the “no man’s land” between architecture and the various other disciplines. It was the beginning of my involvement in collaborative research, and ultimately the formulation of a proposed “Research Institute for Collaborative Education [RICE]”. But that was a long way in the future. I still had Architecture to complete, and I worked like never before. I will be evermore grateful to UQ for having an architectural course embedded with engineering and science. Whilst many of my colleagues resented the fact, I took full advantage to immerse myself in technology. Post-graduation I worked first at RAAF Amberley (first as architectural assistant to the Resident Project Officer of the F111 Programme, and then as Acting Resident Project Manager), I was immersed in technology and loving the challenges in modernising key defence infrastructure. Then followed an indefinite secondment to CSIRO as Northern Regional Architect to work collaboratively with scientists and engineers in the development of various research laboratories. There were always routine laboratories to be developed for fisheries, wildlife and agriculture, but I began to gain a reputation for tackling the unusual—such as the solar flare research laboratory (located west of Narrabri), and a Specific Pathogen Free [SPF] small animal production unit at Indooroopilly – one of the first if not the very first positive pressurised quarantine experimental animal houses in the country. This led to a permanent role within CSIRO (Melbourne)—as Project Manager and Architect for The Australian Animal Health Laboratory [AAHL]which became at completion in 1985 arguably the most significant research laboratory for handling micro-organisms in Australia and the safest place on the planet in which to carry out experimental work with dangerous micro-organisms.and/or potentially serious economic agents such as Foot and Mouth Disease [FMD]. This status remains true today some thirty years on. Later in my career, I consulted to the Canadian Government to review their planning for their equivalent laboratory to AAHL. More recently still, in company with Dr Callis, Chief Scientific Advisor to the UN, I consulted to the UN FAO for the development of India’s high security virus laboratory at Bhopal. I eventually returned to Queensland to work with Thiess, by then Australia’s largest multi-discipline design and construction contractor. At the latter part of my time in Thiess I was appointed Con-joint Professor and Chairman, Property and Infrastructure Development within the Faculty of Engineering and Architecture at Newcastle University. 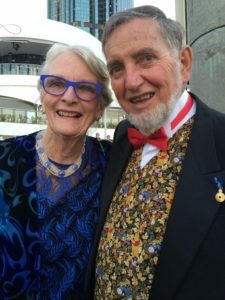 I was diagnosed with Parkinson’s Disease (PD) in 2003 and retired at the age of 65 to take up the challenge of finding a cure for my condition. I was not about to give in to PD. I read widely, travelled to national and international conferences, and volunteered to participate in relevant UQ & QUT research projects. I established an ad hoc think tank which has made significant progress, leading to an Abstract for a Conference Poster accepted for the 2016 Parkinson World Congress (Portland, Oregon). So , “The Boy From the Bush” now reflects on a very interesting life. An initially reluctant UQ architectural student who refocussed his career to embrace technology, I continue to be motivated by collegial engagement and thinking outside of the box (or the silo). My participation in early interactions between architectural, engineering and science students fostered at UQ gave me the confidence to use technology to drive my career. I and members of the CSIRO AAHL team, became world authorities on bio-security infrastructure, and the maintenance of absolute bio-containment – a subject of immense importance to the control of emerging disease agents including Hendra, Ebola, Avian Flu et al. and to assess and prevent bio terrorism and accidental or deliberate breeching of quarantine integrity. Finally I have to thank an education system from primary through to tertiary that gave me, an architect, the ability to make serious progress towards the understanding of Parkinson’s Disease and concurrently to develop a model of affordable and sustainable housing, able to meet or exceed the most stringent environmental regulations so far envisaged. William Curnow AM, B Arch RAIA, Brisbane. This entry was posted in Family and tagged 1950s, Architecture. Bookmark the permalink.